The Ramblers tickled my fancy to pick up for review because you all know I just looooove a good character-driven, relationship-based drama. This sounded like exactly the sort of thoughtful contemporary fiction that I'd be into, especially because the 3 protagonists are all in my age range (early- to mid-thirties). And who doesn't love New York City? 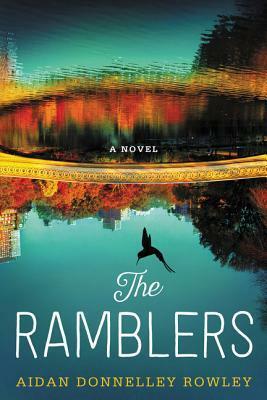 In the end, I have to say I liked The Ramblers, though I can't go so far as to say I adored it. Let's break down the pros and cons. Pros: The prose is incredibly perceptive, peppered with insightful observations about self-actualization, the trials and tribulations of romance, and family bonds. Rowley creates many a gorgeous metaphor between the characters' lives and the book's common plot points (birds, Central Park, photography, etc), so there's no lack of symbolism here. Thoughtful writing: check. I also especially enjoyed Clio as a character, along with her handsome Irish suitor, Henry. (Seriously, if there is someone who is prime candidate for Book Boyfriend of the Year, Henry is IT.) Clio appeals to me because she comes from humble beginnings and a turbulent childhood, so her now-privileged adulthood comes off as more unpretentious. Her problems feel tangible, relateable. I was a big fan of her storyline. Cons: While the writing is perceptive, it is also incredibly verbose--borderline tedious at times. The protagonists' long-winded introspections about their lives started to get some eye-rolling from me after a while. It was too much, and this book could have probably cut at least 20 pages without much trouble. Also, for as much as I liked Clio's character, I found myself rather turned off by Smith and Tate. Smith was hard for me to find sympathy towards. She's been spoiled by her parents for all 34 years of her life, and is now frustrated that she is having trouble getting out from under their millions in order to forge her own path. Um, boo hoo, I guess? I can tell that Rowley tried valiantly to write Smith as a down-to-earth woman despite her social status, but it just didn't happen for me. Her problems felt trite. As for Tate, he was so aloof and crass at times that I just plain old didn't like him. As a duo, I was not digging them at all (though I guess it did seem that they deserved each other, in a way). In the end, The Ramblers is a solid 3-star novel for me. There's lots to enjoy here, especially the penetrating prose. However, there are an equal number of downsides that keep this from being a stand-out read. What's the last character you read that you felt was difficult to relate to, for whatever reason? I'm such a sucker for these types of books...but I also feel like they're really hard to get right. But, when it happens, it's glorious! So much relies on the intangibles...the writing, the life observations, the character development, etc. I agree! I think this one was on the right track, but missed in a few keys areas. I love a good finding-yourself novel when done well. Awesome! I will definitely check it out!